Women, after her face, cares the most about her hair. She uses fancy shampoos, conditioners, styles her hair with a blow- dryer or straightening iron each time before stepping out. She gets extensive hair spa rituals at the salons, aside from colouring them and trimming them. But despite the efforts you are not able to identify the reason behind your hair loss, lack of volume, and the deteriorating texture of your hair. The truth is despite using fancy products, we go wrong on a daily basis in the way we take care of our hair. Just don’t commit these nine common hair mistakes, and your hair will grow thick, strong, shiny and smooth in no time. Your makeup chamber is made up of hair straightening iron, hairdryer, hair gels, sprays and mousses among others. And every time you step you, you feel the need to slather something up your hair, or quickly run the iron past it, or at least hold it in place by blow-drying it. Now, this is a very wrong practice, since these appliances rob your hair off its natural moisture, and make it dry and prone to breakage. The recent rough texture of your hair and instances of hair loss are owing to the chemicals and heat you are subjecting it to. 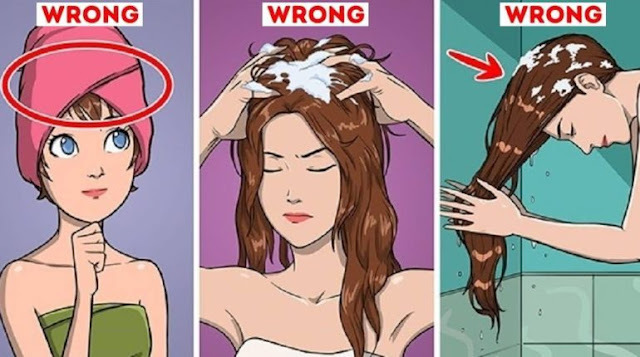 The ideal practice is to brush your hair before a wash. Also most of us are in a habit of directly applying the shampoo to the hair, when this needs to be avoided. Take some shampoo on your palm, depending on the length of your hair, rub it to form foamy lather. Apply this lather to your hair, by gently massaging your scalp only with your fingertips and never by digging your nails into them. Your hair roots will be better nourished with this process and you will lose very little hair. Either you wash your hair too often or far too less, both practices are harmful for your hair. The hair wash frequency should depend on your hair type. Those with oily hair should wash their hair after every couple of days, and those with normal hair can do it twice a week for better results. Aggressive and excessive combing of hair can only damage your hair in the long run as they make your hair prone to breakage. You can’t help run every few hours to the mirror to brush your hair and fix your look, and in the process end up overstretching them. Hence, you complain of hair fall. Also immediate combing of hair after a wash leads to hair loss. Instead untangle the strands with your fingertips, wait for them to dry out and then brush them. For this purpose, always use a broad-toothed comb. The texture of your hair has a lot to do with the way you use your hairdryer, because incorrect usage of hairdryer can totally damage your hair causing hair thinning. To get this right, you need to first towel dry your wet hair. Don’t push the temperature of the hairdryer to the maximum, instead keep it at medium and run it over your hair from root to tip. Make sure you don’t make contact with the hairdryer on your scalp as it can burn your hair. Use it for no more than 5 minutes, and for short hair for 2-3 minutes, else your hair will become excessively dry. Finally, blast some cold hair through your hair to soothe your scalp. Either you don’t eat a balanced diet because of which your hair is not getting its requisite supply of vitamins and minerals. Or you do not eat your meals on time. This affects the overall functioning of your body, and leads to sudden hair loss. Eat a nutritious meal comprising eggs, meat, vegetables, lentils, fruits and nuts, and your hair health will naturally improve. Every time you step out in the sun you don’t give your hair any protection. Sun rays can damage your hair follicles and cause unexpected hair loss. Always cover your hair with a scarf or wear a cap when you need to spend some time in the sun. Just the way you use glares for your eyes, your hair needs cover too. If you have medium length or long hair, you must never let it down at bed as it gets tangled badly and when you brush it you lose hair. Always tie your hair in a loose braid when sleeping, it restores the strength of your hair follicles and keeps the texture intact. You are losing hair because you use a filthy comb. Every time you brush your hair you pump more dirt into it. Do not just pull the excess hair out of your comb and re-use it. Your comb needs to be washed with warm water once a week. This will sterilise it and keep your hair clean and healthy too. Remember, hair hygiene is just as important. Which of these habits to do have? Time you kicked them for strong and healthy hair, naturally.